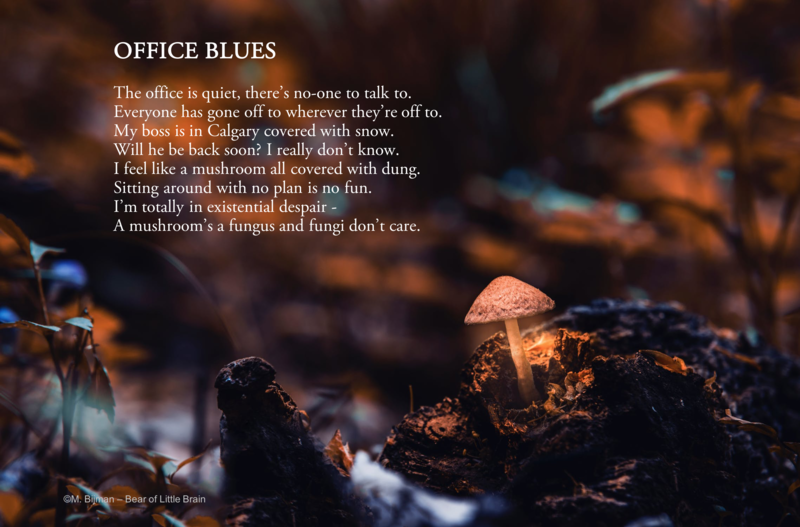 Here are four new rhymes; about the 13th of March when Facebook crashed, about someone who can’t sing, about catching the flu from someone you live with, and about being in a rut at work. These, and the rest of the loose rhymes of a “Bear of Little Brain”, me, are on my poetry page. On Wednesday, 13 March 2019, the Facebook, Instagram and Whatsapp platforms all went down, or fell over, or couldn’t be used, or however you want to put it, for almost 24 hours. The Facebook outage, which by far affected the most users, was a disaster for some and a miraculous release for others. 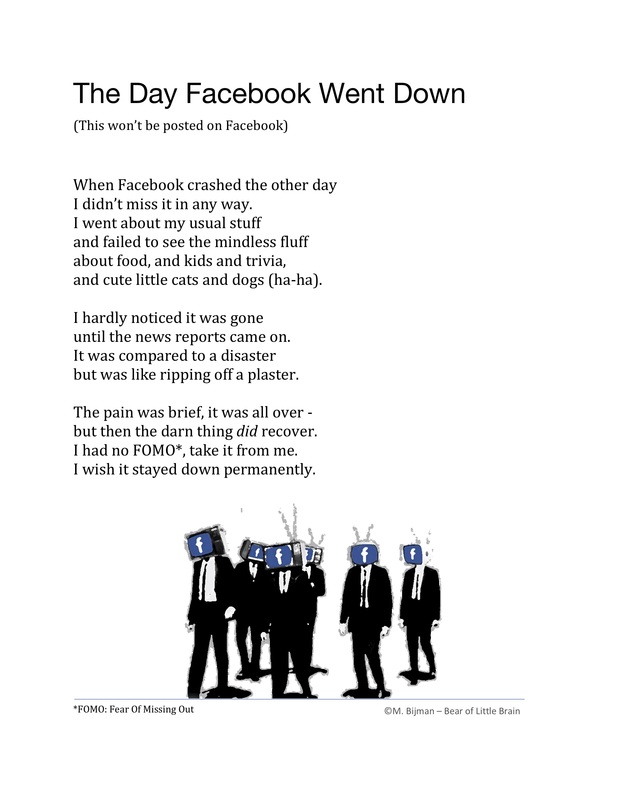 Brian Bilston wrote a poem about what he got up to when Facebook went down. It made me think about what I did while Facebook was down. So I wrote my own poem about it. Each line is either 8 or 9 syllables, arranged in rhyming couplets. My S.O. is a man of many virtues and talents, but we both admit that the one thing he cannot do is sing. It is something I have to put up with. So, here, below, is my ode to living in hubby’s version of La-La Land. I had Burt Bacharach’s tune that was used in the Austin Powers and Casino Royale movies, The Look of Love, in my head like an “ear-worm” for days (a.k.a. “Stuck Song Syndrome”). It is truly a pain to go to sleep with it, dream of it, and wake up with it. In my defence, I had flu and my brain was not working right. 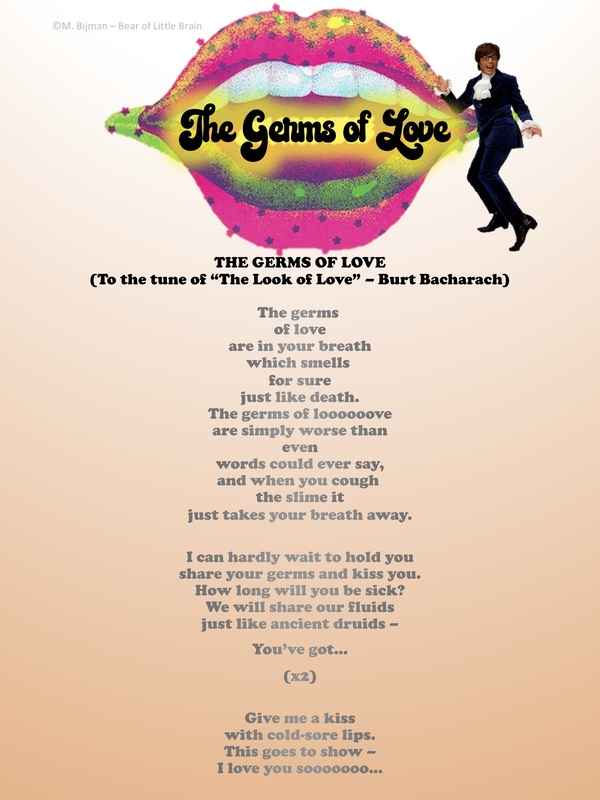 So, to chase out the horrible song, I wrote other words for it: The Germs of Love. It’s all about the fact that when you live together, you pass your flu germs from one person to another, ad infinitum. 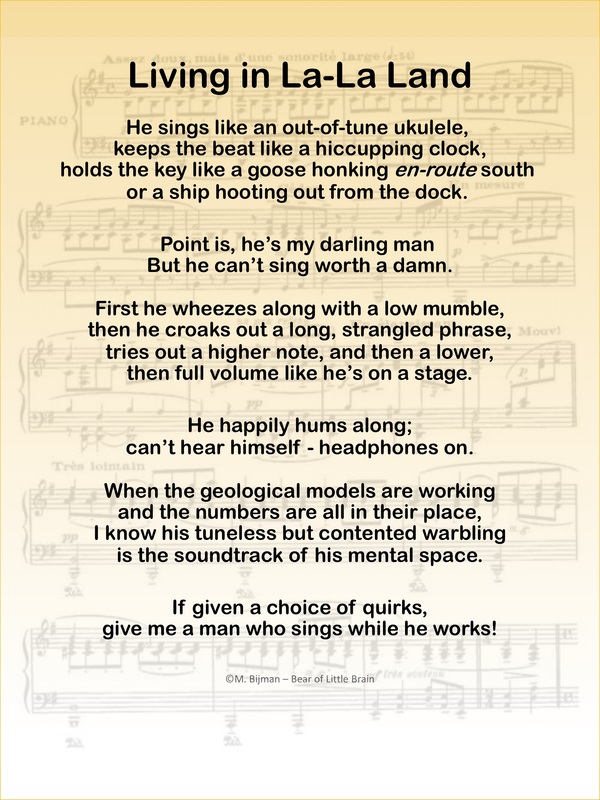 Go ahead, right-click, read the poem and sing along – the instrumental version is below. Don’t say I didn’t warn you when it gets stuck in your head. This is self-explanatory. If you have a job, you know how this feels.